Visiting the Pantheon is best before 11 am, when the place gets crowded. We are comparing Discover Pantheon: Guided Tour of the Glory of Rome Prices from leading ticket suppliers and Try to find you Cheap tickets prices on the market. Pantheon is one of the most striking structures of the city of Rome, commissioned as a temple and later converted into a church. Ordered by Marco Agrippa, a friend and a general of the Emperor Octavian Augustus, Pantheon honored the gods of Rome. Starting from the 7th century AD, Christian martyrs and prominent people were buried beneath the vaults of the former Roman temple. The tour provides information about the significant people interred there, including famous artist Raphael and a few kings of Italy. A tour guide elaborates interesting facts, such as those concerning Pantheon's perfect proportions. Visiting the Pantheon is the right thing to do for every visitor of Rome regardless of their personal interests. The activity is suitable for young, adult and senior visitors alike since it doesn't require an exceptional fitness level. Fans of history and architecture and devotees of Raphael should consider joining the tour in particular. Your Experience With Discover Pantheon: Guided Tour of the Glory of Rome? Discover Roman Pantheon, an emblematic structure featuring perfect proportions and layers of history. Learn the origins of the Pantheon, commissioned by Agrippa, the general of Octavian Augustus, and its role as a temple honoring the gods of Rome before the Christian times. Find out when the temple became the Christian place of worship. See how the light illuminates the interior of the classical structure through Oculus. Admire the ideal proportions of the Pantheon and find out who lays here alongside Raphael, a famous Renaissance artist. What Discover Pantheon: Guided Tour of the Glory of Rome Includes? A knowledgeable, passionate and friendly guide leads the guided tour. Pantheon is so exceptionally preserved just because it became a church; Colosseum, for example, was stripped from a great deal of its stonework. Pay attention to the area around the triangular pediment outside - it appears that the columns supporting it are shorter than initially intended. Travelers Reviews about Discover Pantheon: Guided Tour of the Glory of Rome? According to the travelers that took part in the tour, the activity is well worth the price and the invested time. The reviewers state that their assigned guides elaborated the structure and its works of art in detail. They also underline that the guides speak English fluently and commend their professionalism and knowledge. 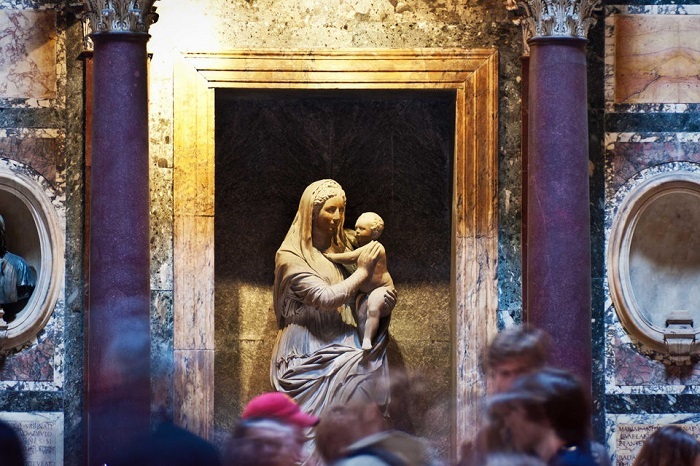 Some of them say that visiting the Pantheon is among must-do things for every visitor to Rome. The comments indicate that joining the tour makes a big difference over visiting the classical monument on your own. People suffering from limited mobility and in wheelchairs are welcome to join the guided tour. Printed and electronic vouchers are both acceptable for this activity. A full refund is issued to travelers who cancel their orders no later than 24 hours before the beginning of the guided tour. Dress decently and respectfully to enter the Pantheon, which is an operating religious structure. To borrow an audio guide, you need to deposit an official identification (ID card, passport, driver's license...).